This book discusses the issues of integration within food and fibre supply chains and the challenges in managing price risk. 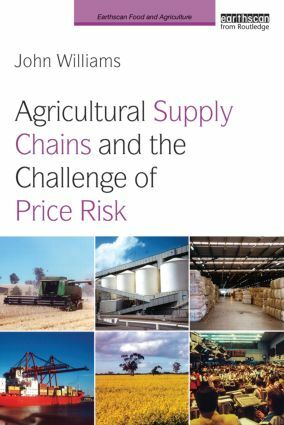 The problems of integration and price risk are interwoven in agricultural supply chains with production and supply risk as well as hoarding. However, without supply chain integration through commercial trade markets there can be no forward market upon which forward transactions and the management of price risk can be based. Without a forward market that can reduce opportunistic behaviour, there is likely to be little security of supply, particularly under high production risk and price uncertainty. Whilst price risk management is possible under certain circumstances, there are many factors that can prevent the development of forward markets or cause them to collapse, thus undermining the ability to manage price risk within acceptable risk and return parameters. Market positions therefore need to be valued and often settled daily due to the risk of contract default. In addition, the issue of currency risk and its management applies to international market positions and transactional exposures. The book analyses a range of price risk management strategies from forward contracting through to futures and options hedging, and finally to over-the-counter products. Evaluation techniques are developed to aid decision-making. The author concludes that forward market development may be the exception rather than the norm, and that whilst favourable price risk management outcomes may be possible, they can sometimes be caused more by luck than through good management. It is shown how tactics are an important consideration in decision-making to minimize costs and losses.